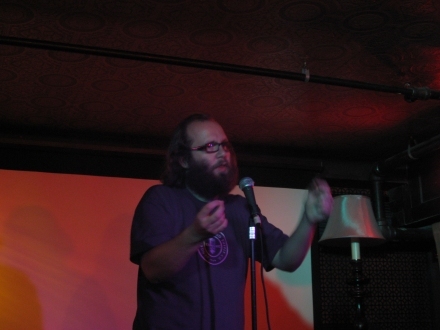 British comedian and storyteller Daniel Kitson killed for almost two hours on Sunday night with his new show, “It’s The Fireworks Talking”. One more picture after the jump. nice! 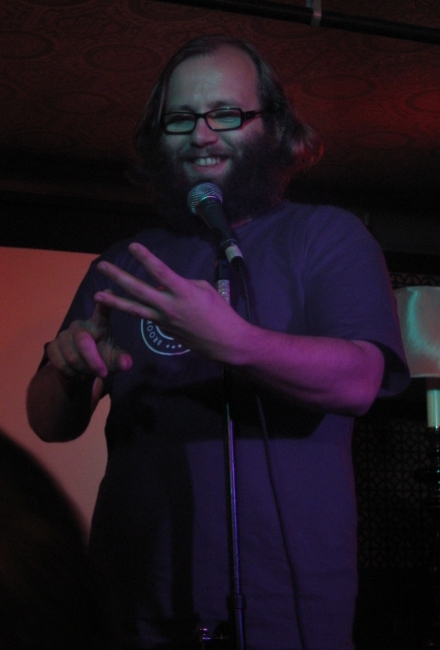 i wish i had a photo from his mo pitkins show b/c it was his first proper haircut in a decade, he said. but just a brilliant show. what does it say on his shirt? It’s a shirt from 826 NYC (Dave Eggers’ Superhero Store). He said right off the bat that he wasn’t pandering to the local (Park Slope) crowd, he just didn’t have any clean clothes left.